Some big nods to Vangelis and Klaus Schulze here. The foundation tracks were pretty heavily influenced by Vangelis (Blade Runner era) there is also some Klaus Schulze echos (Timewind). I think Timewind got me thinking about time travel... 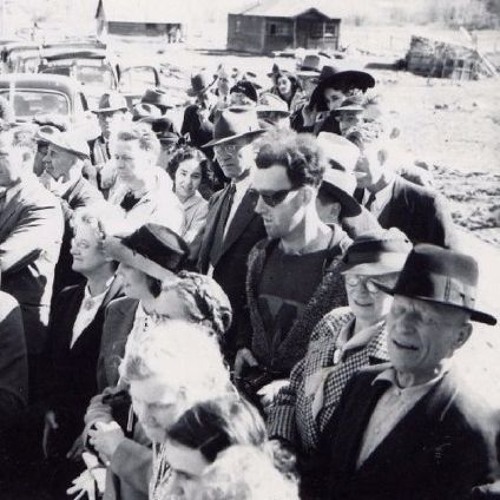 The picture is A classic "time travel" picture on the internet aka hipster time-traveler. I believe there is a JFK tie-in. Enjoy! @battle-moose: Thanks for the info, I'll check him out. @dukeseager: Thanks! Enjoy - Schulze is a prolific musician and has a massive catalog. Timewind, Blackdance, Transfer, Body Love, and Audentity are particular favorites of mine. His new one Shadowlands (the 2 cd version) is also very good. The Dark Side of the Moog work with Pete Namlook is also really good as is his CD Farscape done with Lisa Gerrard (of Dead Can Dance fame). Excellent! I'll have to check out Klaus Schulze now. @battle-moose: i tried a REAL cs50 2 weeks ago at a freinds place.It was so amazing and beautiful. @confessormusic: Thanks! Wondering that myself, but music is subjective after all.